Bootsy Collins and Prince signed with Warner Bros. around the same time. CINCINNATI -- "Prince come in like gangbusters ... and crossing all barriers. And it was like, 'Wow.' That's when we really started paying attention -- 'This cat knows what he’s actually doing.'" Bootsy Collins knew Prince better than most. In the late '70s, both joined Warner Bros. around the same time. "We were, like, feeling our oats," Collins said. "We were, like, doing it at that time. He was coming to the shows, and, like, the Funk Fest we had in LA, we had over 100,000 people." 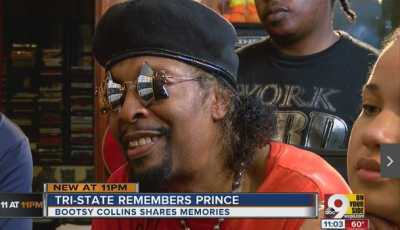 Learning from each other, Collins said there was something so unique about Prince. "He mixed the music and the business together," Collins recalled, "and he didn't have which one was better and which one was worse." Prince died Thursday. He was 57 years old. During his career, he led the cutting edge of an industry where faces were beginning to change. Roger Klug, musician and assistant professor at the University of Cincinnati College-Conservatory of Music, noted how Prince couldn't be pigeonholed into a single musical category. He branched out, Klug said, and truly had his own style. "Very sexual, and of course, he presented himself in a very sexual way," Klug said. "Which so did David Bowie -- with the androgynous kind of image." It wasn't just musical boundaries, Klug said. Prince also broke racial boundaries: "Prince, along with Michael Jackson, those were the two first black artists on MTV -- I mean to be in heavy rotation."